Winner of the UK’s Best New Tourism Project Award in 2005. Set within 120 acres of beautiful Kent countryside, Lullingstone Castle is one of England’s oldest family estates. The Manor House and Gatehouse – which overlook a stunning 15-acre lake – were built in 1497 and have been home to the same family ever since. 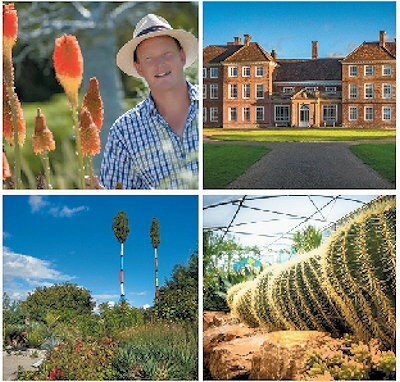 In 2005, Tom Hart Dyke – 20th generation of Hart Dykes to live at Lullingstone – created within the Castle grounds a unique and inspiring ‘World Garden’ and filled it with thousands of rare, unusual and beautiful plants collected from all over the world (Tom came up with the idea for the garden whilst being held hostage in the Colombian jungle in 2000!) Don’t also miss the chance to explore the Hot & Spiky and Hot ‘n’ Juicy Cactus houses on your visit, as well as the new orchid temperate house ‘Orchis’. You will also have the opportunity to view inside his home – Lullingstone Castle. Opening times: April through October; Garden and House open Fridays, Saturdays, Sundays and Bank Holiday Mondays 12-5pm (except Good Friday) For special events (see below) 11-5pm. Pre-booked guided groups for House, Church and Garden on Wednesdays and Thursdays by arrangement and for Garden only tours on Mondays and Tuesdays. Admission Rates: Adults £9.00, Senior Citizen £7.50, Child £4.50, Family £20.00. Season ticket available (£30.00 for one year, £40.00 for two). Group Rates: Minimum group size: 20. Guided groups £9.00 per person plus £65 per group for a dedicated guide. Unguided Groups (during opening times): Normal Charges Apply. Facilities: Toilets, book and plant sales, gift shop, light refreshments during opening times or full catering at visitor centre (10 min walk away). Picnics welcome. Disabled Access: Yes. Toilet and parking for disabled on site. Wheelchairs available upon request. Mexican Celebration Weekend 21st and 22nd September. For further information on events see website. Length of Visit: 2-3 hours. Booking Contact: Mrs Guy Hart Dyke. Lullingstone Castle, Eynsford, Kent DA4 0JA. Location: Off the A225 near the village of Eynsford and just 10 minutes drive from Junction 3 of M25.